The first meeting between our company and Westminster Presbyterian Church occurred in 1994 while they were planning a new larger sanctuary adjacent to their original worship space. Project advisor, Bob Clark, and his former student, church organist Peter van Eenam worked to involve our shop in the final stages of the building design, one of the few times we've had the luxury of planning the organ during and not after the fact. The organ was finally dedicated on May 2, 1999, five years after the initial contact. This time span is fairly typical of projects in our shop. 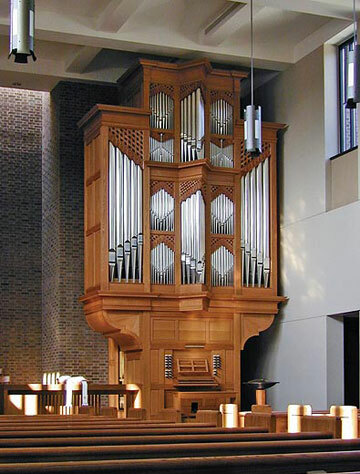 The organ, built as a sister with opus 8, was designed first, to be a symmetrical case placed asymmetrically at the front of the church. At first glance this may seem odd, but reflects the varied needs and duties of the organist/choir director that must be performed from the organ bench, as well as ensuring a tighter choral ensemble than would be possible if split on both sides of the organ. A large emphasis of this project was an organ that could play Bach well, in spite of the second manual being enclosed in a swell box. The result, combined with extra money spent on acoustical issues of the building, convincingly renders music of that era, while showing its chameleon properties in supporting a wide range of vocal and instrumental ensembles.